Oxorcist II, Imperial Pumpkin Ale, from Old Ox Brewery, will be available at Shocktober this season*! Check out our FEARGarden to taste yours today! It is scary good! *Please note there are no beer or wine sales on Sundays. Yum! Oxorcist II Imperial Pumpkin Ale was brewed with over 100lbs of pumpkin. It’s scary good! Shocktober has partnered with Old Ox Brewery to create a hauntingly good beer, Oxorcist II. MawMaw Carver performs the blessing of the Oxorcist Imperial Pumpkin Ale brewing process at Old Ox Brewery while her zombie hoard look on in support. It was carnage at Old Ox Brewery Wednesday afternoon. 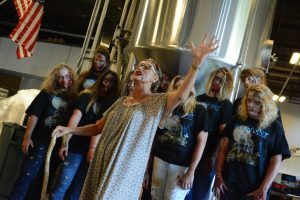 Zombies arrived in overwhelming number, and in a matter of minutes they had torn through the tasting room and made their shuffling way into the brewery, where they were drawn to a towering, stainless steel tank. As brewers watched, quivering, from behind packing crates, the zombie family’s matriarch, Mamaw Carver, led a blessing of the beer inside. The brewery remains open for business. Aurora School Testing Coordinator Katie Loudermilk, as Mamaw Carver, leads a blessing of this year’s Oxorcist Imperial Pumpkin Ale at Old Ox Brewery. The zombies were teachers at the Paxton Campus’s Aurora School, which works with autistic children, and they had come to celebrate Paxton Campus’s partnership with Old Ox Brewery. This year, the third year of the limited-release Oxorcist Imperial Pumpkin Ale, Old Ox has partnered with Paxton Campus for Shocktober. Oxorcist will be promoted alongside Shocktober, and the label will feature Paxton manor.“From the very beginning, we thought that sounds like a great idea. It sounds right up our alley,” said Old Ox co-owner Chris Burns. That partnership also led to another: Old Ox now hires people in Paxton Campus’s Step Up program, graduates from the school, to assemble its variety packages of canned beers. “It’s a labor-intensive process for a small team like ours,” Burns said. “We’ve only got four people on our production staff, so to take them away from their brewing duties to pack variety packs makes for a lot of long hours.” The Step Up program, Burns said, is a great fit for his brewery, and he hopes to bring them in more often. The collaboration was born when Visit Loudoun President and CEO Beth Erickson connected Paxton Campus Communications Coordinator Rachel Roseberry and Old Ox. “She thought we should be a natural fit, because we’re community-focused, we’re always looking for work with good local charitable causes, and she knew that we do this Oxorcist brew in the fall,” Burns said. This will be the sixth year of Paxton Campus’s Shocktober, at the giant, historic manor the Paxton family first dedicated to charitable causes in the 1920s. About 100 volunteers guide (and terrify) visitors in a giant haunted house, and this year, Shocktober will also host an all-night paranormal investigation in the manor by Mid-Atlantic Paranormal Investigators. Aurora School Testing Coordinator Katie Loudermilk as the menacing Mamaw Carver. Oxorcist will be available in bottles and kegs at select retailers. The brewery will host a launch party with Paxton Campus at the brewery from 5:30 to 7 p.m. Sept. 16.